my baby Bubba is turning 2 soon. i can hardly believe it. he's growing up into such a little guy. a sweet little guy with words and manners and personality and a sense of humor. an affectionate little guy who's sensitive but brave. he's rough but kind. he loves to sleep and has way better things to do than eat. his heart belongs to Mama and he wants to be just like Daddy. please indulge me here...i'm not done yet. Bubba loves real tools- screwdrivers, hammers, and drill bits. he loves meatloaf. he has his Mama's sweet tooth. he loves cold milk first thing in the morning. his favorite book, second to "Diggers," is "I Know A Rhino." his favorite kid songs are the ABC song and Itsy Bitsy Spider. he'd rather be outside than inside. he'd rather be walking/running than in the stroller/buggy/being held. he has no interest in watching TV but loves playing with Mama's camera. he likes dogs but isn't so sure about cats. he loves to play Play Doh, color with pens and markers, and build towers with Legos. he likes to take a "guy" and a little car when we go places. he loves routines and structure. he loves brushing his teeth and getting his hair cut. he's my little guy and i love him so very much. 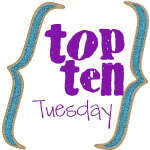 thanks OhAmanda.com for hosting Top Ten Tuesday and letting me go on and on about my almost 2 year old son.